The Best Business Intelligence blogs from thousands of top Business Intelligence blogs in our index using search and social metrics. Data will be refreshed once a week. Also check out Business Intelligence Podcasts. Business Intelligence newsletter is a comprehensive summary of the day's most important blog posts and news articles from the best Business Intelligence websites on the web, and delivered to your email inbox each morning. To subscribe, simply provide us with your email address. About Blog Business Intelligence feed by Reddit. Keep up with Commercial and Open Source Business Intelligence Tools and Techniques. Facebook fans 1,026,822. Twitter followers 443,818. About Blog "R" is a language and open-source software used as a standard by statisticians in the development of statistical software. R-Bloggers focuses on tutorials and tips for using R to create effective and efficient applications for use in Business Intelligence and other solutions. Facebook fans 74,977. Twitter followers 65,551. Carlsbad, CA About Blog Acquire the knowledge, products, and services you need to run and grow your business. Facebook fans 32,341. Twitter followers 7,057. About Blog A well-known, premium B2B Technology brand, IT Business Edge is part of the QuinStreet Enterprise. IT Business Edge seeks to help executives make strategic decisions by providing articles and resources from leading industry experts in Business Intelligence. Facebook fans 3,166. Twitter followers 14,474. New York, NY About Blog Read all the latest news, discussions and practical tips on complex data analytics, business intelligence software and big data. Facebook fans 12,232. Twitter followers 3,631. North Carolina, USA About Blog ChristianSteven Software delivers advanced Business Intelligence (BI) solutions that solve mission-critical large enterprise needs and includes reporting, distribution, scheduling, dashboards and automating business processes. Facebook fans 5,762. Twitter followers 4,032. San Francisco, CA About Blog Questions about our business analytics software? This blog will help u solve all your business intelligence related queries. Facebook fans 2,670. Twitter followers 14,070. About Blog Business Intelligence Blogs featured by Microsoft. Facebook fans 10,931,158. Twitter followers 54,461. Boston, Mass. About Blog Business Intelligence (BI) news, analysis, research, how-to, opinion, and video. Facebook fans 57,227. Twitter followers 164,263. Massachusetts, USA About Blog Network World provides information, intelligence, and insight for network and IT executives. The Big Data/Business Intelligence section of the site specifically focuses on the news, trends, and opinions related to Big Data and Business Intelligence, making it an invaluable tool for executives and other members of the field who need the latest Business Intelligence information and resources. Facebook fans 137,428. Twitter followers 98,562. About Blog SmartData Collective is an online community that provides enterprise leaders access to the latest Business Intelligence trends. As a “platform for recognized, global experts to share their insights through peer contributions, custom content publishing and alignment with with industry leaders. Facebook fans n/a. Twitter followers 32,438. About Blog DATAVERSITY offers rescues for IT professionals, executives, and business managers on data uses and management. DATAVERSITY offers a wealth of useful resources, including the blog, that features posts written by leading experts and consultants in the Business Intelligence field. Facebook fans 6,302. Twitter followers 14,174. Scottsdale, AZ About Blog Toolbox for IT is an online community for IT professionals and it provides business intelligence blogs. Facebook fans 1,845. Twitter followers 3,450. Seattle, WA About Blog Collection of news, tips & tricks, training, entertainment, and happenings around Tableau. Learn, play, and find your own insights. Facebook fans 137,654. Twitter followers 96,396. Facebook fans 63,961. Twitter followers 84,396. About Blog The JetReports Blog features insights on Business Intelligence, marketing, sales, development, and related topics, with tips and information on maximizing and optimizing your data to drive results. Jet Reports is an affordable Business Intelligence and reporting solution that leverages existing investments to facilitate streamlined, informed decision-making. Facebook fans 532. Twitter followers 1,695. Malvern, PA About Blog BI Software Insight works to help organizations make smart Business Intelligence software purchasing decisions. Their team of experts provide reviews, resource guides, and insights on the latest news and trends in the world of BI, and their blog does the same. Facebook fans 297. Twitter followers 1,525. McKinney, TX About Blog Welcome to our Business Intelligence blog for CIOs, IT managers and analysts where we cover the trickiest BI-related issues. If you want to read about recent BI trends to empower your business or learn how to visualize your data to satisfy different business users needs you've landed in the right place! NYC About Blog Business Intelligence News and Trends. Driving Business Success With Technology. Facebook fans 499. Twitter followers 1,845. Worldwide About Blog A blog for connecting with the Business Intelligence community: Read what companies are gaining with planning, analysis & reporting with Jedox. Facebook fans 645. Twitter followers 1,353. Durban About Blog Get better business insight with flexible Excel-based reporting. As a business owner in today's technologically revolutionary environment, it’s becoming more and more evident that, in order to stay up-to-date and remain relevant, you need to have your latest data readily available to make those crucial business decisions. Facebook fans 120. Twitter followers 982. Global About Blog Learn the latest trends in business intelligence for your industry, job role or ERP through our blog. Facebook fans 317. Twitter followers 1,262. USA, UK, Netherlands & Israel About Blog Pyramid Analytics address may key issues in the BI space. Our blog covers BI topics for the novice through to the most advanced BI analyst. subscribe today to stay in the loop. Facebook fans 5,458. Twitter followers 6,304. Newton, MA About Blog Global coverage of the business intelligence ecosystem. Facebook fans n/a. Twitter followers 4,488. Threemilestone, United Kingdom About Blog Get the latest news related to Business Intelligence from Gasworld. Facebook fans 667. Twitter followers 6,479. About Blog Quality Content for Data Management Professionals Since 1997. TDAN is the industry leading publication for people interested in learning about data administration and data management disciplines & businees intelligence. Facebook fans 29. Twitter followers 196. Boston, MA About Blog MineralTree provides the easiest to use Accounts Payable (AP) and Payment Automation solutions for finance professionals. MineralTree streamlines AP, giving customers unparalleled visibility and significant cost savings in an affordable, integrated platform that is guaranteed secure. Facebook fans 160. Twitter followers 1,153. Tampa, Florida About Blog Business Intelligence and Analytics industry coverage, how to articles, events and news. Facebook fans 273. Twitter followers 7,902. Hyderabad About Blog Nexiilabs a trusted name providing cloud computing solution in India and reliable name for software qa testing in India. Facebook fans 594. Twitter followers 875. Facebook fans 584. Twitter followers 1,234. About Blog Panorama is innovative business intelligence software company, working to make business intellegence analysis simple. Discover our software solutions here. Facebook fans 8,164. Twitter followers 6,695. London, United Kingdom About Blog Visiongain publishes independent, insightful, analytical market-led business information. Reports cover a 10 year forecast & company analysis; in rapidly evolving economic and technological landscapes, Visiongain reports will help you understand the opportunities from changes in technologies, materials & regulations. Facebook fans 449. Twitter followers 1,228. Global About Blog The Business Intelligence Group was founded with a mission to reward organizations, products and individuals for superior performances with business awards. Facebook fans 167. Twitter followers 5,304. Hyderabad, India About Blog Helical Insight is worlds first open source Business Intelligence framework. It is completely browser based solution and provides all the capabilities expected out of any BI tool like user role management, multi-tenant environment, exporting, email scheduling, device compatibility, Administration etc. Facebook fans 461. Twitter followers 82. Global About Blog Unleash the power of collective insight with analytics business solutions from SAP. Facebook fans 63,196. Twitter followers 200,103. Dallas, Texas About Blog Tim Mitchell is a business intelligence consultant, author, and trainer. He specializes in ETL/SSIS, data warehouse architecture, and data quality. Facebook fans 123. Twitter followers 3,712. Ahmedabad, Gujarat, India About Blog Business Intelligence and Corporate Performance Management Blog keeps you stay abreast of what’s new and resourceful in BI world for improving productivity and accountability. Facebook fans 9,228. Twitter followers 898. About Blog PARIS develops and implements BI solutions worldwide. We know there is a better way to work with data that makes people's lives better. Facebook fans 172. Twitter followers 7,519. Facebook fans 1,687. Twitter followers 2,427. Pittsburgh, PA About Blog John Daniel Associates, a business intelligence practice, provides Cognos, Qlik, NPrinting & custom application solutions. Facebook fans 32. Twitter followers 276. About Blog Hub Designs Magazine includes articles that cover topics of importance to the Business Intelligence community, including data management, strategies, and business best practices. Facebook fans 202. Twitter followers 712. About Blog Business Intelligence, Open Source and Big Data. Brasil About Blog We're Passionate About Business Intelligence. Facebook fans 279. Twitter followers 35. About Blog BI Jobs is a specialist jobs resource for the Business Intelligence & Analytics community - actively managed by staffing specialists with a background in BI recruitment. Facebook fans 33. Twitter followers 479. Cloud About Blog BI4Cloud includes blogs which provide Effortless Business Intelligence. Facebook fans 8. Twitter followers 37. Auckland / Wellington, NZ About Blog Read what the Stellar Consulting team has to say on Business Intelligence Strategy, BI Technology, Data Warehousing, Advanced Analytics, Big Data and more. Facebook fans 31. Twitter followers 429. West Palm Beach About Blog Business Intelligence software that provides a multi-dimensional view of workforce and project productivity analytics for organizations who struggle to collect and interpret data to optimize and forecast performance with more certainty. Manage Opportunities. Not Spreadsheets. Facebook fans 39. Twitter followers 30. Menlo Park, CA About Blog Darren Cunningham is the brains behind In(tegrate) the Clouds. His interests focus on analytics, integration, innovation, big data, and the cloud, and his fairly regular posts share his insights on these topics and their relation to Business Intelligence. Facebook fans n/a. Twitter followers 6,556. Melbourne, Sydney, Global About Blog Business intelligence and data management solutions. Facebook fans n/a. Twitter followers 2,407. New York About Blog Maintained by Ramesh Babu, this blog offers a variety of educational resources to advance professional understanding of business intelligence. About Blog Intuitive Business Intelligence is the author of Intuitive Dashboards, the next generation of Business Intelligence (BI) software, which enables faster and more accurate decision-making. Facebook fans 53. Twitter followers 640. About Blog BusinessIntelligence.com is the place for BI decision makers to access the most current and highest quality BI content aggregated from across the web. Bringing to you all the latest news in the world of business intelligence. Facebook fans 1,030. Twitter followers 27,109. 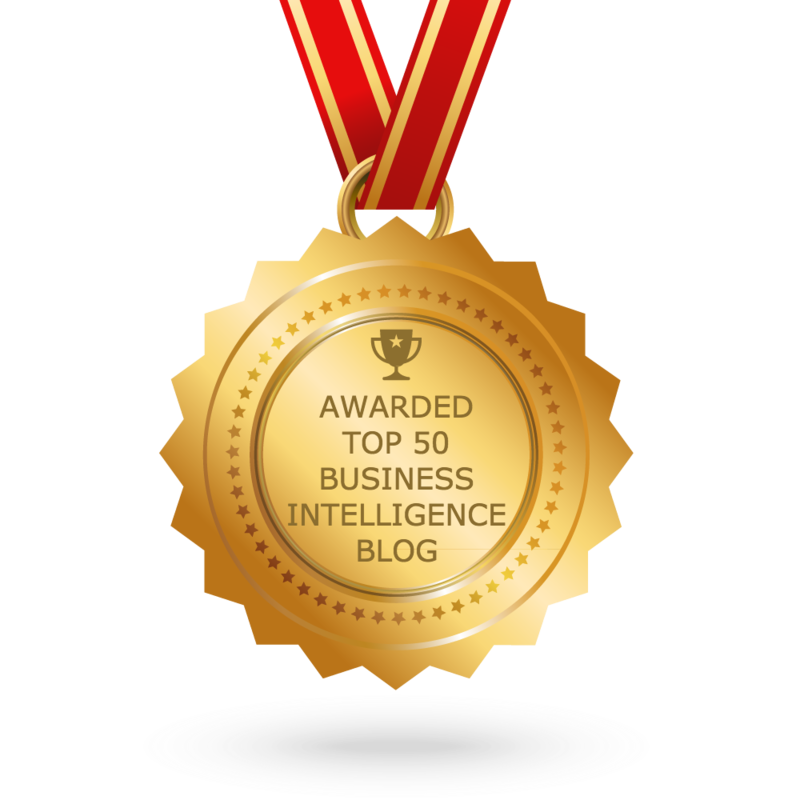 CONGRATULATIONS to every blogger that has made this Top Business Intelligence blogs list! This is the most comprehensive list of best Business Intelligence blogs on the internet and I’m honoured to have you as part of this! I personally give you a high-five and want to thank you for your contribution to this world.